Our full submission is available here. It’s endorsed by Friends of Science in Medicine (FSM) and the writing was assisted by two Monash University students, Malcolm Vickers (MPH) and Alanna Rottler (BMedSci (Honors). The submission points out that many suggestions put forward by civil society in previous consultations to the TGA, the Senate Inquiry into the Therapeutic Goods Amendment Bill (2017 Measures No. 1) Bill 2017, a Civil Society Public Forum held at the Australian National University, media articles and TGA stakeholder consultations have been ignored. We note that the TGA appears to give equal validly to ‘traditional’ and ‘scientific’ evidence, which is not in keeping with modern scientific understanding as documented in the NHMRC’s levels of evidence. 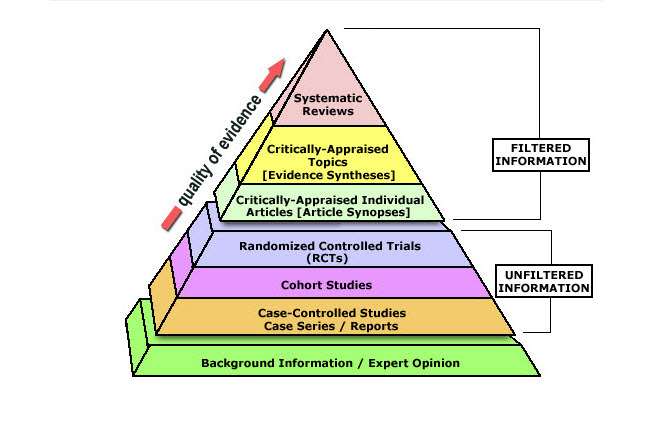 Traditional evidence (opinion) occupies the lowest level of the hierarchy of evidence. See below. We also point out that ‘traditional’ medicines can be both ineffective and dangerous and their increasing mass marketing often includes misleading and deceptive claims which takes advantage of consumer ignorance. Given our multicultural and pluralistic society, we accept that it’s appropriate for Australians to have access alternative medical traditions and products. There is also considerable national pride in Traditional Chinese Medicine (TCM), Ayurveda and Unani and valuable knowledge can be found in such traditions. However, many of the theories on which such traditions are based have not been validated by scientific inquiry, such as the TCM concept of meridians through which the life-energy known as ‘qi’ flows, the Ayurveda concept of life-forces (dosha) and body types (vata, pitta and kapha), and the homeopathic principle of ‘like cures like’. In addition, traditional medicines can be both ineffective and dangerous. We argue that it is important to ensure that consumers understand the difference between “traditional” and “scientific” evidence. We also need to restrain the increasing mass marketing of traditional medicines from taking advantage of consumer ignorance and we need to protect consumers from misleading and deceptive claims about such products. In appendix I, III and IV of our submission we have listed many products invoking traditional paradigms that make claims we allege are misleading and deceptive. We reiterate, a likely perverse outcome of the Permitted Indication policy will be that sponsors of complementary medicines will change the indications of many of their products from “scientific” to “traditional” and increasingly introduce the latter, to the detriment of public health. All claims invoking traditional paradigms must be accompanied by an advisory statement such as, “The claims for this product are based on traditional beliefs and not modern scientific evidence”. If there is conflicting evidence between the history of traditional use and contemporary scientific evidence for your medicine, all labeling and advertising material must state: “This traditional use is not supported by scientific evidence”. If there is both a history of traditional use and contemporary scientific evidence supporting the claims made then the above advisories need not apply. “Please seek the advice of a traditional Chinese medicine practitioner or Ayurvedic medicine practitioner to ensure this medicine is right for you”. Research is required on whether TGA advisories and others suggested will achieve the desired objective. This is now underway at Monash University. This entry was posted in Complementary medicine, Medicine policy, Pharmaceutical Promotion and tagged Ayurveda, FSM, Homeopathy, TGA, Therapeutic Goods Advertising Code, Traditional Chinese Medicine (TCM), Unani. Bookmark the permalink.